All praise for new hall: Church-goers during a worship session. 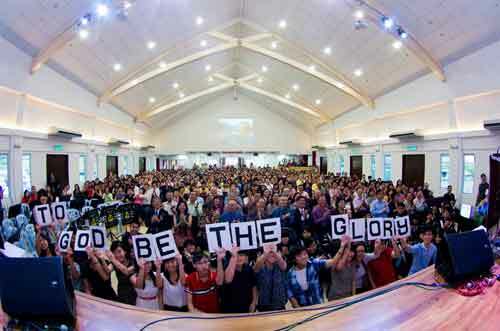 JOHOR BARU: It was a poignant moment for the congregation of Holy Light Church (English) when their retired pastor Reverend Nicholas Yeo took the stage of the newly completed Faith Worship Hall to sing ‘My Tribute (To God)’. This is understandable considering that the congregation had waited close to 20 years to have their own Church building. On Sunday Oct 28 their dream finally came true when the completion of the RM4Million multi-purpose hall in Persiaran Ponderosa Utama project finally came to fruition. Close to 700 worshippers turned up for the morning service. It was also a double celebration as the Church is 60 years old this year. It was in August 1952 when an English missionary, Reverend George Hood first started the English Service. In his message to the congregation, Pastor Dr Chuah Seong Peng recounted the faithfulness of God to the church through all the years and called on everyone present to see, know, and live with God who alone is one whom we can depend on living in this challenging time. In June this year, Deputy Prime Minister provided a grant of RM500,000 from the federal government towards the construction of the building. This was in addition to the RM200,000 the Church received earlier from the Johor state government in August 2010. The congregation then adjourned to the Pekin Restaurant at Taman Molek for the 60th anniversary luncheon after the service. 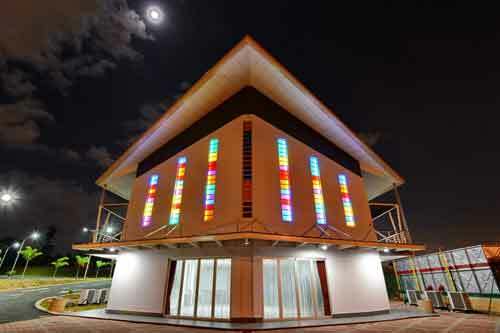 Well equipped: The Holy Light church's multi-purpose hall in Persiaran Ponderosa, Johor Baru.